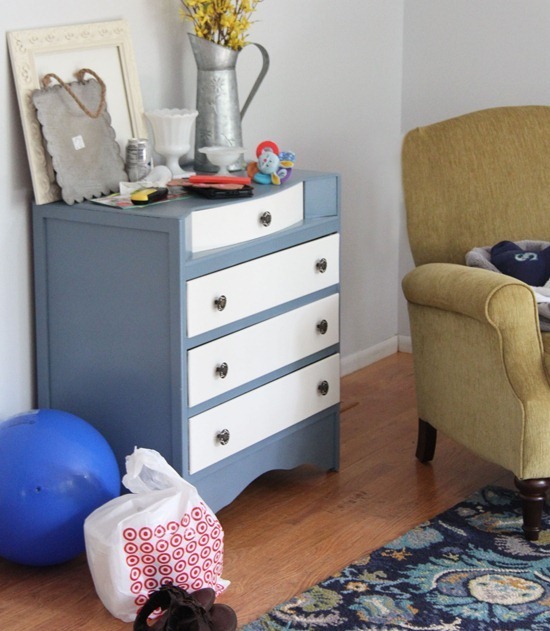 Ready or not for another dresser re-finish??? It’s all I got…so I hope you don’t mind! I walked into Goodwill last month and this little dresser had to be mine. I went over to the counter, paid the $20 and it turns out another lady bought the dresser at the SAME time! What are the odds?! So the worker compared our receipts and I bought it 3 minutes before she did. Needless to say she was mad at me and stormed off in a huff…it was worth it. The knobs are my favorite. Now its fresh faced and happy in my home. I spray painted the blue (Slate blue spray paint from Home Depot) and rolled the drawers. I don’t usually spray paint large-ish furniture because the sheen is always a bit off in places…but I added a water based protectant afterwards that evened it out. I even happened to snap a “real” photo (checking my light) before I cleared all of my crap off and made my house look clean for the photo above. ooooh, I love it! 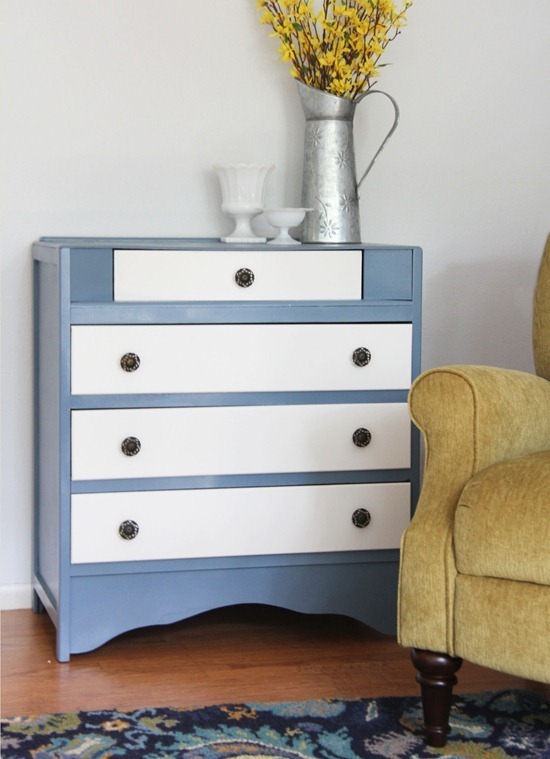 I love the color you chose and the white drawers! Nice that you could use the original knobs too! I love projects like that! Tremendous! Don't you just love Goodwill?!! You never know what you'll find. Love it! Great colors and looks good with your rug without being too matchy-matchy. What a difference! I love seeing peoples restorations. I have trouble seeing the end product you guys are so talented! I would be so excited to come acros such a lovely piece, love the colour, it would look so good in my bedroom. You have done a great job. I'd would be very happy to have this in my home. WHERE did you get that rug?! The dresser is adorable, but I'm in the market for a rug and that one is a beauty. I never score there, no wonder! I'm just not quick enough. Cute paint. nice buy! i can never find anything like that. Great colour choices to liven it up. That is gorgeous! I love spray paint it makes painting so much easier and no more of those stupid brush lines! I'm jealous of your score! $20! What a bargain. Just beautiful. Great job. Happy you were 3 minutes earlier. It has turned out very yummy. Wish we had Goodwill here in the UK but we don't. Excellent choice of color! Great find, great pic! 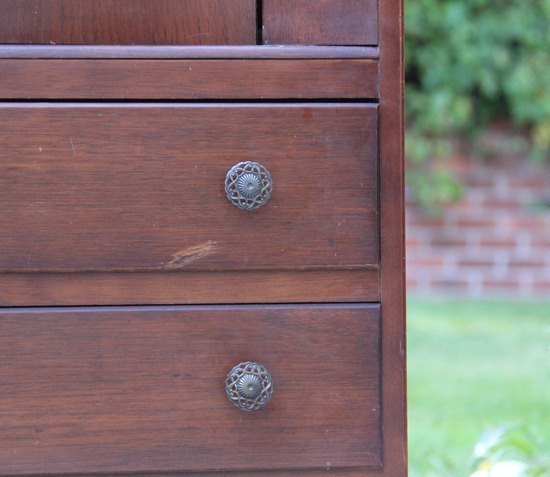 Great dresser – you've made a lovely job of it! Sssh, don't give away our housekeeping secrets! Gorgeous dresser! I have only just found your blog and have totally enjoyed trolling through your patterns…I'll be back!!! What a deal and that's a sweet transformation. BUT what about that great rug – how sweet is that? The source? Loooovvvveeeee it! The knobs caught my attention too. Nice job! I love the knobs too. Oooohhhh! Makes me wish I had bought the buffet server I saw for only $15 yesterday. And it was 25% off day, too! Why didn't I get it? Oh yes, because we never get around to finishing stuff off. Sigh! You are amazing, not only with quilting but with reclaimed furniture. I am once again in awe. Great redo! I really like those knobs too. What a cute dresser! I only have a couple of tables and one dresser in my home that were bought new. The rest have all been used and painted to work where ever I need them. And I need a couple more just have not found the right ones yet. The knobs are really nice, which is the hardest part of use furniture. Either half are missing or they are not nice at all. You just do the cutest things with these furniture pieces ! Where did you EVER find a matching pull for that top drawer? Was it hiding in one of the other drawers? 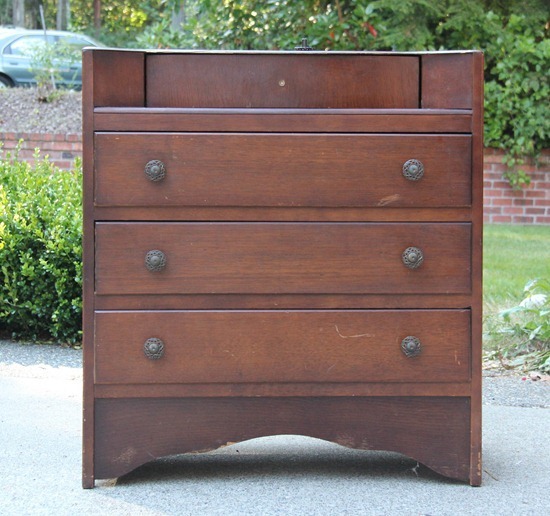 Love the dresser design, I can understand why you were so happy to be the first to buy it! What an absolute beautiful color! And that is not a messy house, not even close! Gosh I love furniture redos so, makes me want to get to goodwill. This turned out perfect! Gorgeous! The blue is wonderful. You did a great job, I don't know if I would dare use spray paint on a piece that large. The color is so even. I can see why you like the knobs, they are gorgeous! I love you colors… Goodwill is awesome! !